It’s the wrong way to go about it. Yes, they are stimulatory, but do they stick? 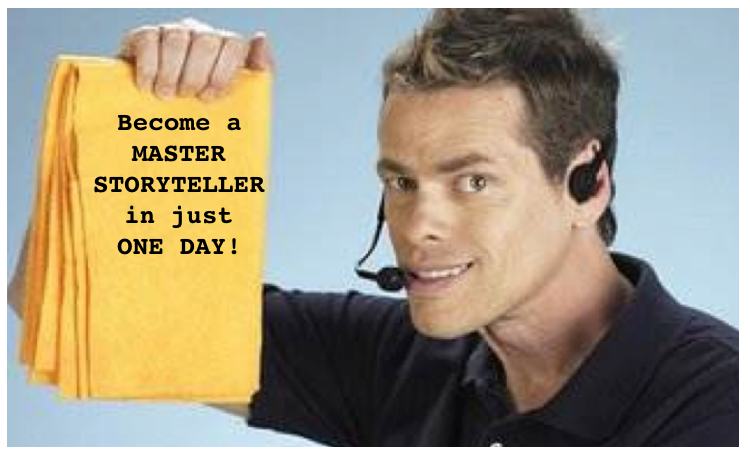 Can you “master” the power of storytelling in one day? No. How about one year? No. My gut says I’d prefer the exciting one day event. It sounds more stimulating, and really convenient to get “the whole communications thing” done and out of the way in just a single day. But my head knows better. The one day offering is noisy nonsense. Yes, it’s stimulatory, but so is being forced to watch, “A Clockwork Orange,” five times in a row with your eyelids held open. Improving your ability to communicate does not, and cannot, happen that quickly. Why? Because it requires the development of intuition. Read Malcolm Gladwell’s landmark book, “Blink!” and you’ll get some appreciation for what is required to develop intuition. It all comes down to one word: time. When you work with the ABT Framework you learn about the DHY form for content. It stands for Despite, However, Yet. What it represents is too many narrative threads all at once — which is stimulatory, but confusing. There is an optimal form for narrative. It is expressed in shorthand with the ABT Template of And, But, Therefore. All else equal, this is the form for narrative structure that is the optimum. Running people through a packed day, one topic after another, is basically taking the DHY approach to learning. Yes, it’s stimulatory, but think of it as a bunch of white heat that goes quickly from cold to hot then back to cold again. I hate to get too specific on this, so I’ll avoid examples from the science world. Keeping it broad, just search “One Day Storytelling Workshop” and you’ll find pages and pages of them from around the world. Here’s one in Oregon that I’m sure is a lot of fun, but what is your goal? Do you want to have a fun, exciting day, or do you really want to improve your ability to communicate (for which narrative is the central element). Imagine going to the gym for a 7 hour workout. Do you think after 2 hours you’re accomplishing anything meaningful? And is it even possible you’re doing more damage than good after 2 hours? It’s the same thing. It really is. More is not more when it comes to improving your grasp of narrative. That’s what I’m talking about. Everyone in the discussion seemed to be realizing this, and they felt like they had been lied to. This stuff is difficult. You definitely can get much better at it, but it doesn’t happen in one hour, one day, or even a one week boot camp. Here’s a great tidbit to this point. We’ve been working with folks at Genentech for the past year. We ran a Story Circle there with 5 scientists, meaning they met for the standard 10 one hour sessions that the training involves. Ideally the sessions happen one per week, meaning 2.5 months. But in their case, their schedules are so intense with so much travel, it took them 8 months to finish the training. Which is fine. So long as they stay committed, it doesn’t hurt to have the delays, though it’s still a little better to stay close to the weekly schedule if possible. So I asked them when it was over what would they think, given the intensity of schedules there, if we were to run a Story Circle that met three times a week, allowing it to be finished in less than a month. They immediately recoiled with a solid, “No.” It didn’t begin to makes sense to them to do that. They insisted that taking at least a week between sessions was essential to allow the training to slowly work its way down from the head to the gut. There is no substitute for time. Sorry. Plain and simple. Don’t whine to me about your busy schedule. Do you want to improve or not? We’ve been hard at it for 3 years now developing Story Circles. If there’s one solid conclusion we can offer up, this is definitely it. And guess what is at the heart of narrative. Time. I have a therapist friend who is fond of the expression, “You can’t rush the river.” Therapy is narrative. It’s all the same stuff. Narrative is everything. This is what grieving is about. You can’t rush it. You can try. But if you want to genuinely heal, you can’t rush it. Sorry. Welcome to life. At least for now, until A.I. takes over. For now, we’re still stuck with these 4,000 year old principles. But the good news is, if you invest the time, you’ll see the changes. Story Circles takes time, and it’s even hard to quantify the outcomes (heaven forbid). But there is one clear metric which is that groups are coming back for more — especially with USDA, NPS and USFWS. We’ve run over 30 Story Circles now. We have about a dozen Demo Days being planned for next year, including at Western Society of Naturalists in February, University of Idaho in April, and several government agencies in the spring. We’ve yet to do any advertising or have any media coverage. We don’t need to. There’s lots of scientists who get it. They’ve tried the one day thing. It didn’t work. They’re ready to eat the Brussels sprouts.